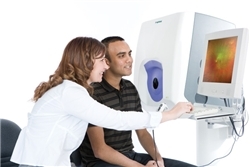 New technology now available at Total Eye Care allows us to scan a patient’s retina for glaucoma and macular degeneration, and the best part ….. it does it WITHOUT DILATION! This new instrument is called the Zeiss Cirrus OCT and it is truly state of the art. The Zeiss OCT uses infra-red light from a scanning laser to make a very high resolution, 3D image of the inside of your eye, much like that of an MRI. We can now identify retinal objects as small as 4 microns. So how small is 4 microns? A single sheet of 20 lb copy paper is 100 microns thick. This new technology allows us to detect glaucoma and macular degeneration much earlier as well as allowing us to detect and track subtle retinal changes. Who is a candidate for this new technology? Anyone with a family or personal history of glaucoma, glaucoma suspect or macular degeneration should take advantage of this technology. Call the Colleyville office at 817.416.0333 and let Rona or Kelsey know that you would like to take advantage of the new scanning laser technology right away.